The barrel support DID raise point of impact, it has to if it is doing it's job! That is why you have the little round thingies on top and side of your scope!! No harm in trying removing it but I THINK you will find that the rifle shoots better with a barrel support. Those ar thin and kind of long barrels and they really vibrate with each shot. 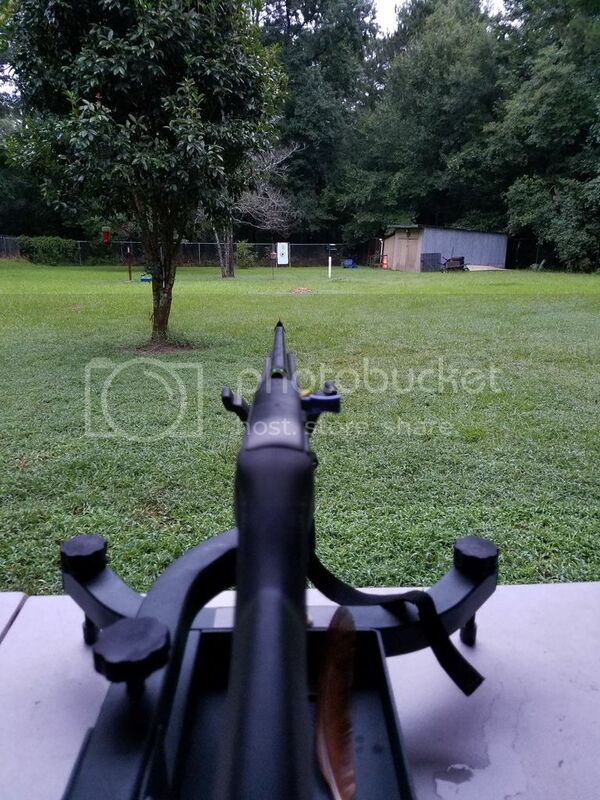 WHEN you find it shoots better with the support ( ) THEN it is time to test moving the barrel support around to see where it shoots best and it really matters. 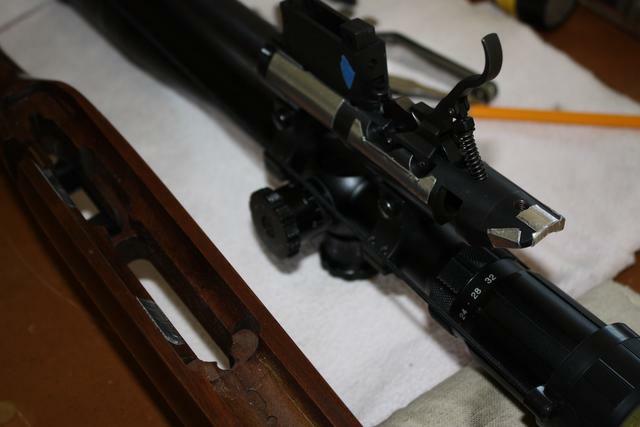 Didn't you rifle have a wood support at the end of the fore end under that barrel? Most sporters do. That is because the rifles usually shoot better with them (the rubber works better). Those factory engineers get paid big money to determine that most of these rifles shoot better with a support! Thanks for the opinion. I suspect you are correct. Yes it does have an area at the end of the stock that is higher and that is where I placed the rubber "bumper" I will remove and try and/or move it around to see the results and post when I can. Forgot to say.. . Thanks for the tip on the scope! That sure works better than bending the barrel in my vice and saves a lot on sandpaper trying to get rid of the teeth marks from the vice. Well heck we have to look out for each other right!!? A VERY quick funny story. In fact it it was with a rifle that had a 511 action called a Nylon 11. 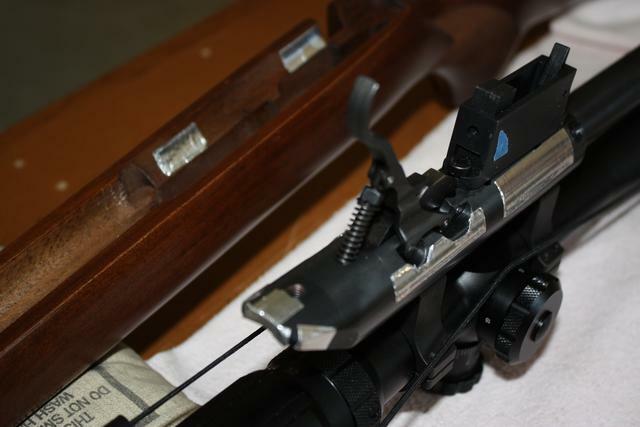 It was a 511 barreled action in a Nylon stock much like the semi auto Rem Nylon 66. It was pretty new when I started shooting in the 5th grade @11 years old. I had taken a NRA Marksmanship class that was every Sunday for 12 weeks on the base range at China Lake Naval Weapons Test Center in the Mojave Desert of CA. It was taught by a World War ONE Marine Gunnery SGT!! He still had the scars on his face from the German (not what he called them ) Mustard Gas!! Anyway The people that took me shooting were now taking a much better shooter than 3 months before as the old Gunny knew his business (he competed at Camp Perry every year) and to this day EVERY TIME I pick up a rifle or hand gun I hear that old man's voice saying "All gun's are always loaded Son". Now I was shooting better than my best friend's dad! He had a little 3/4 inch 4X scope on the rifle. Bushnell I think but does not matter. I really liked the scopes view of the target but none of us could hit ANYTHING with the scope on the rifle!! It was off by 6" at 25 yards. Disgusted he took it off the little rifle to make sure the rifle was okay. It was. He declared the scope a POS and he was going to talk to the shop that sold it to him. 1st Class petty Officer and BIG I would not have wanted him mad at me. You mean that scope was ADJUSTABLE? I ran for the phone as that day was trash pick up day in Navy Housing. He was out digging through the trash and found the scope just as the truck came around the corner! Willie Clement called me back and said "You know those round things on the scope? THOSE ARE JUST CAPS!" he paused for effect......."There are slotted things under the caps!" Last edited by Vincent; 07-17-2016 at 12:39 PM. I came across this thread in the search for better accuracy of my daughters 10/22 for her 4H small bore competition shooting. The only thing I did different was I stuck the aluminum foil tape on stock instead of the receiver. I am very happy with the results! Sorry for the pics, but it's been raining here in Louisiana and I just slapped some paint on target to check the grouping. here's the other thread I posted more details. target at 50 yards, top right group is Federal 36g bulk ammo, bottom left is Winchester M-22 40g bulk ammo. Rifle is a Ruger 10/22, synthetic stock, fiber optic sights, extended mag release, modified bolt release, OnTactical charging handle w/ black spring, full floated barrel, aluminum foil tape bedded receiver. I got a CZ 455 Varmint about 3 months ago. It wasn't a bad shooter, but I new it could be improved upon. So yesterday I got out the aluminum tape. There's not much difference from the Rem that Vincent done at the beginning of the thread. But being the pictures have been taken away, I figured I would add some. The tape that you see in the stock was removed. It was there for lipstick testing, prior to making the sides. I also used a feeler gauge where I could. That way I knew how many layers I needed in each area and could stack my tape, and cut to size on the bench, before putting it on the action. I already had a RTV pad in the channel. 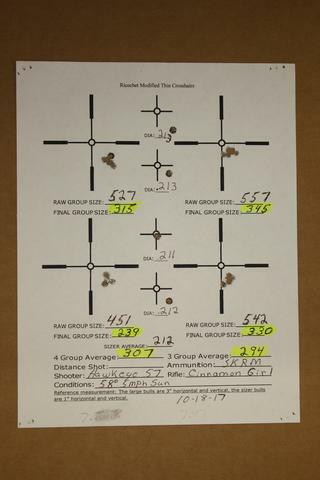 Before the tape bedding my best at 50 yards was a 4- group .491, and 3- group 388, with SK RM. Today I shot this target with the same ammo, and got a qualifier for Clem's 3/8 game. 4- group .307, 3-group .294. I just noticed I forgot to put the distance on the target, but it was shot at 50. It may need another layer in the future, but it can work . 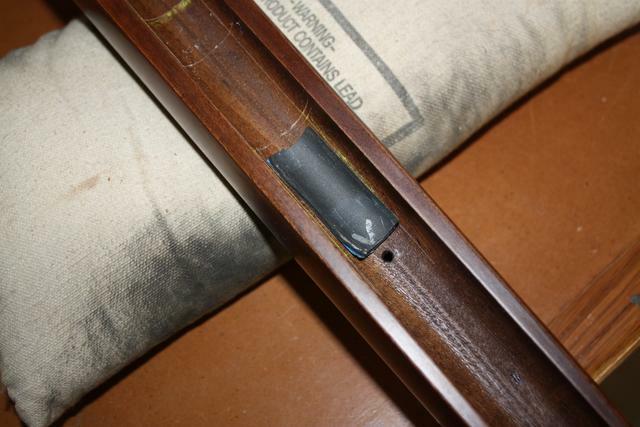 I done my 10/22 two years ago, and a year later I pulled the tape, and epoxy bedded. The difference between the tape , and the epoxy was not noticeable. Vincent this is what I call getting lots of mileage out of a thread 5 years and still getting replies. This is what happens when you have great members in a forum. Good information never dies. Not comparing to those guys but people still read what Elmer Keith, Skeeter Skelton, Townsend Whelen and those guys had to say 40-70 years ago so why not 5 years here? Thanks for the new pics by the way!! Last edited by Al the Infidel; 11-28-2017 at 08:15 AM. I tried the Mozilla link twice and get a file not found message, is the link corrupted? Awesome sticky Vincent. Eventually I might try a real glass bedding job, but for now, I’m not confident enough to do it myself. This looks like a fun project to experiment with. If it doesn’t work out, no harm done. I’m also getting some DIP action screws to work out what torque my Trainer responds to best. Thanks for the info. This thread keeps on ticking. Bit late to the party but it doesn't work for me either. I have been saving this post/thread for years, and finally, figure I would like to try. There is a fellow on da Tube that just uses minimal amounts of epoxy to bed his rifle(s), but, after my first attempt at glass bedding, I'm not really anxious to put my foot back in the water. I have a roll of aluminum tape somewhere in my basement, and think I may try the method on my rifles. My wife got me a red dot sight for Christmas, and I have it mounted on my 10-22, waiting for warmer weather to go to the range. Thing is, I'm not sure if it will be precise enough to observe any improvement. Any opinions? However; my scoped guns should have no problems with that! forrest r; Thank you, too! The pictures have disappeared, but if I understand, Plasti-Dip is the solution of choice there? Oboy...! Don't let a rimfire addict uhmmmm....enthusiast, I MEANT enthusiast! start to scheme!